For associated ILD, the optimal FVC cut point was 80% predicted and the optimal DLCO cut point was 62% predicted. 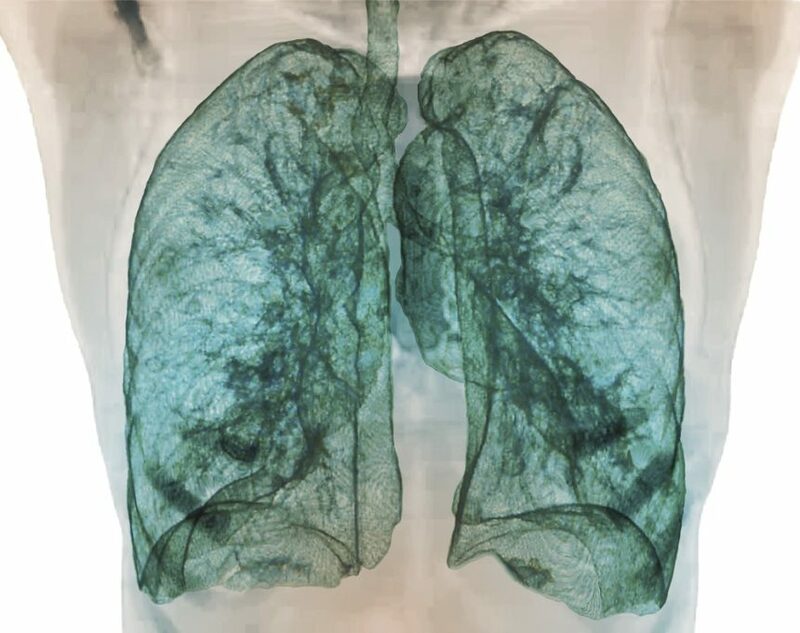 Clinicians should incorporate chest high-resolution computed tomography (HRCT) when screening patients with systemic sclerosis (SSc)-associated interstitial lung disease (ILD) even when pulmonary function tests results are normal, according to study results published in The Journal of Rheumatology. Researchers aimed “to (1) identify optimal individual [forced vital capacity; FVC] and [diffusing capacity of lungs for carbon monoxide; DLCO] % predicted cutpoints for associated ILD on HRCT, and (2) to determine the sensitivity, specificity, and [negative predictive value] of varying individual and combined FVC and DLCO% [ predicted thresholds for associated ILD on HRCT.” The study population (n=265) was 81.5% women, had a mean age of 50±12 years at time of HRCT, and were 73% white. The researchers used chest HRCT and pulmonary function tests in their assessments. The authors found that 49% of the study population had diffuse cutaneous SSc, 30% were positive for antitopoisomerase I serum antibodies, had a mean SSc disease duration of 6.4 years, and 71% had radiographic ILD present. In addition, 31% of participants had normal FVC and 151 had accurate DLCO measurements and radiographic ILD and 43% had normal DLCO. The authors noted that participant exclusion from DLCO analysis due to poor pulmonary function tests was not a factor. Regarding associated ILD, the data showed the optimal FVC cut point was 80% predicted (sensitivity 0.69 and specificity 0.73) and the optimal DLCO cut point was 62% predicted (sensitivity 0.60 and specificity 0.70). The authors noted “[t]he combination of DLCO<62% or FVC<80% predicted had a sensitivity and specificity for ILD of 0.80 and 0.56, respectively.” The use of an algorithm provided inappropriate classifications. The researchers noted the following limitations of their study: a lack of generalizability as data were collected from only 1 center, inconsistency of DLCO data, a lack of determination of the effect of ILD severity-varying pulmonary function test thresholds, and the exclusion of patients with lung malignancy, transplant, and resection. Showalter K, Hoffmann A, Rouleau G, et al. Performance of forced vital capacity and lung diffusion cutpoints for associated radiographic interstitial lung disease in systemic sclerosis. J Rheumatol. 2018;45(11):1572-1576.